My family and I have recently moved from Nevada to Kentucky. We’re getting settled in, but there’s so much new information to take in, my head is spinning. I have a 4-year-old and a 13-year-old. Are the car seat and seat belt laws different between the two states? Jessi Says: Congratulations on your new move. When the dust settles and the last box is to the curb, there’s still so much to do, isn’t there? I may not be able to help you unpack, but I can definitely point you in the right direction, when it comes to vehicle safety. I get questions like this fairly frequently. So, I’ve found a couple sites to help me figure these things out. The short answer is, yes. There are some big differences between Kentucky and Nevada laws, especially when it comes to car seats. The two states’ laws are similar in general, but they aren’t the same. They use different criteria to determine who is obligated to use a car seat or booster, so rather then get long-winded and crazy, I’ll direct you to my cheat-sheet sites with charts that will break it down more simply and efficiently than I can. While all of the states in the US agree that car seats are a must, they do determine how long a child should use them differently. The basic factors they take under consideration are weight, height and age. Each state’s laws are based on one, or usually a combination, of these factors. To find out the current regulations in your state visit this site. The grid is pretty straightforward. Find your state, and then see where your child fits into the designated determining criteria. 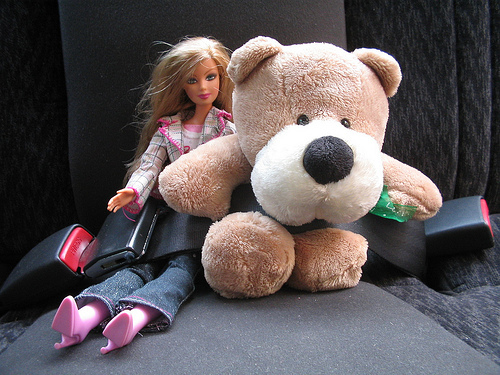 The US has some bizarre variances in seat belt laws from childhood straight through adulthood. It’s definitely a good idea to check out this site to find the specifics of the laws in your state. Don’t let the chart intimidate you, it’s fairly simple. The basic factors for determining who should be wearing a seat belt are age and location of the seat. For example, I live in Illinois and kissed 18 goodbye a mighty long time ago, so if I sit in the front seat, I have to wear a seat belt. If I’m sitting in the back seat, I’m not required by law to wear a seat belt. Everyone should take a quick minute to check out their states’ regulations for car seat and seat belt usage every six or so months. Laws have a tendency to change, and it’s better to be safe than sorry. Jessi Arias-Cooper is owner and writer of Mama’s Got Flair and the senior writer at Advice4Parenting.com. She is a work-from-home mother of 3 boys and has been married for 10 years. If she had time for hobbies and interests outside of parenting and keeping house, they would be jewelry making, baking, watching bad B-movie horror flicks and creative writing . If you have a question for Jessi, click here.